WE DELIVER MORE POWERFUL INSIGHTS. The nation’s 396 most visible opinion research companies are evaluated on an ongoing basis by the independent, non-partisan statisticians at 538 dot com. The higher the percentile, the better the score. 100th percentile is the highest possible score. 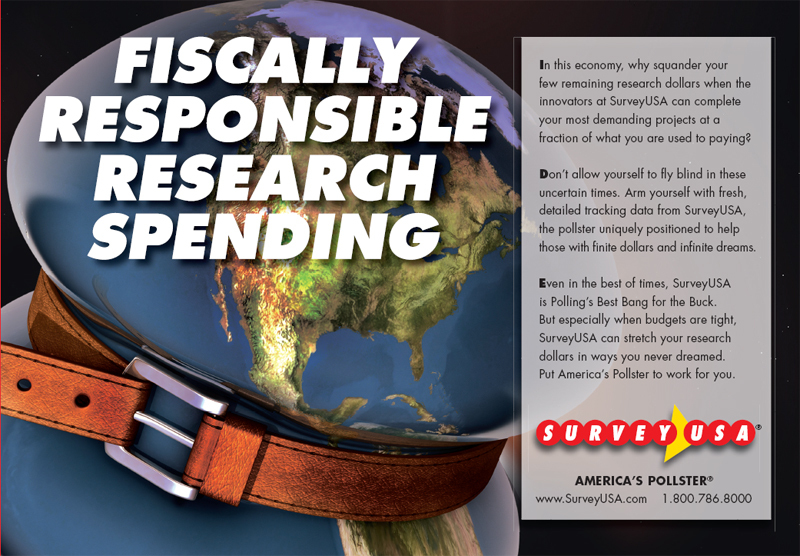 No research company of any size scores as highly as SurveyUSA on four key metrics: how accurate our surveys are; how much predictive value our surveys have; how little partisan bias our surveys have; and how prolific SurveyUSA is. SurveyUSA has completed 40,000 discrete pieces of research for 400 clients. 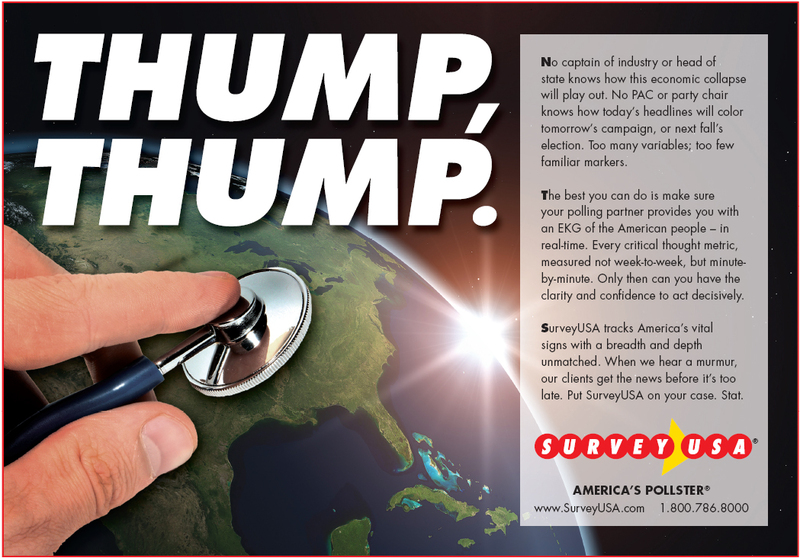 In round numbers, that means that a typical SurveyUSA client has commissioned 100 separate SurveyUSA research studies. Returning customers are our lifeblood. In the research business, you do not have repeat customers unless your antennae are fine tuned to the client’s needs and to the respondent’s needs. We listen: When you first contact SurveyUSA to discuss a possible project, you won’t be connected to a junior account exec. 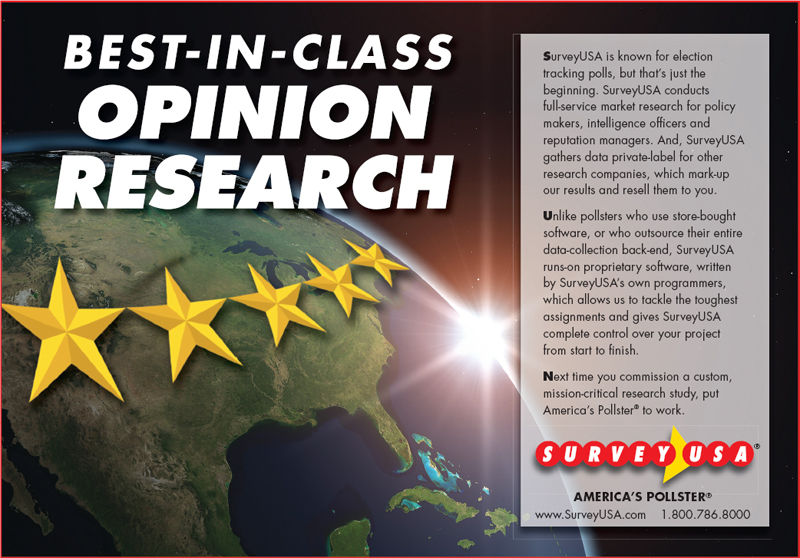 When you contact SurveyUSA, you’ll speak directly to a principal, someone with at least 20 years of experience conducting opinion research for demanding clients; someone with at least 20 years of experience practicing The SurveyUSA Way. We have a lot of practice listening — not just to what is said, but also to what is not said. We are great at reading between the lines. Our clients feel “heard” because our clients are heard. SurveyUSA principals are not responsible for just one aspect of your project. No sales person takes your money and hands you off to a stranger. SurveyUSA principals are responsible for every aspect of your project, from beginning to end. Because we listen, your needs are met. Why do you think research data will help you? Why do you want to commission a survey now? What do you hope to learn that will make you more productive? You would be surprised at how many projects snap into crisp focus, both for the client and for SurveyUSA, once we see how that sentence ends. Way too often, at other research companies, an expensive project gets completed and the client realizes only after having paid for it that the data points are incomplete: that the research company failed to ask one or more essential questions that were needed to produce truly great learning. SurveyUSA endeavors to strike a fine balance between learning everything we can from a client before we start work on a project and talking a project to death. In the 21st century, there are many different approaches to opinion research: you can ring a respondent’s home telephone and speak questions into a respondent’s ear using live operators; you can ring a respondent’s home telephone and speak questions into a respondent’s ear using recorded voice; you can hand-dial a respondent’s cell phone and speak questions into a respondent’s ear; you can text a single question to a respondent and wait for him to text you back; you can walk through a neighborhood, ringing random doorbells; you can stand on a busy street corner and intercept random passersby; you can conduct a live, in-person focus group; you can conduct a virtual focus-group, and/or you can interview respondents leveraging the power of the internet, showing respondents questions on their desktop, laptop, tablet, mobile phone, or other electronic device, and allowing respondents to respond at the time and place of their choosing. Each of these methodologies has unique strengths. Each of these methodologies has unique limitations. That, we feel, is our obligation: to tell prospective clients what realistically is possible given your unique circumstances, your particular budget, and the realities of conducting research in an 8-second attention-span world. That is why SurveyUSA does not offer on our website a shopping cart where you click to order and click to pay. With opinion research, every job is custom; we choose not to pretend to warehouse our “best-sellers” in digital inventory. Just as one would not use a soup spoon to paddle a canoe nor a butter knife to shovel snow, SurveyUSA will match you with the tool best suited to your project. Let us level with you. That’s a key part of The SurveyUSA Way. But we sleep better knowing we don’t just go along for the ride when the client is headed in the wrong direction. Many of our competitors are owned by statisticians, political operatives, or PR firms. There’s a time and a place for a statistician. There’s a time and a place for a political operative. But that time and place is not when a questionnaire is being developed. A questionnaire is like a poem. It must have rhythm … pentameter. A questionnaire cannot be written by someone whose whole life is cosigns and asymptotes. A questionnaire is not unlike haiku. Not only is every word important, but very syllable is important. Every space and punctuation mark is important. Sometimes, this means we go back and forth with the client, politely asking that certain adverbs be removed, taking out the loaded nouns, balancing the un-balanced, dissecting “double-barrel” questions into separate components. We think the extra time we spend collaborating with you on your questionnaire is worth it. If you do not understand the distinction between a “field and tab” data collection firm and a full-service research company … a “field and tab” house will take whatever comes over the transom, price it, and run it. A full-service research company has an obligation, before anything gets locked, to dissect the questionnaire into its atomic parts, and make sure that the whole is greater than the sum of those atomic parts. After all is said and done, opinion research is a conversation. Nothing more. Nothing less. The more natural the respondent feels about the give and take, the better the data we collect. Only after considerable back-and-forth, once everything is as close to perfect as is possible, do we lock the questionnaire. It’s a critical step and a key part of The SurveyUSA Way. 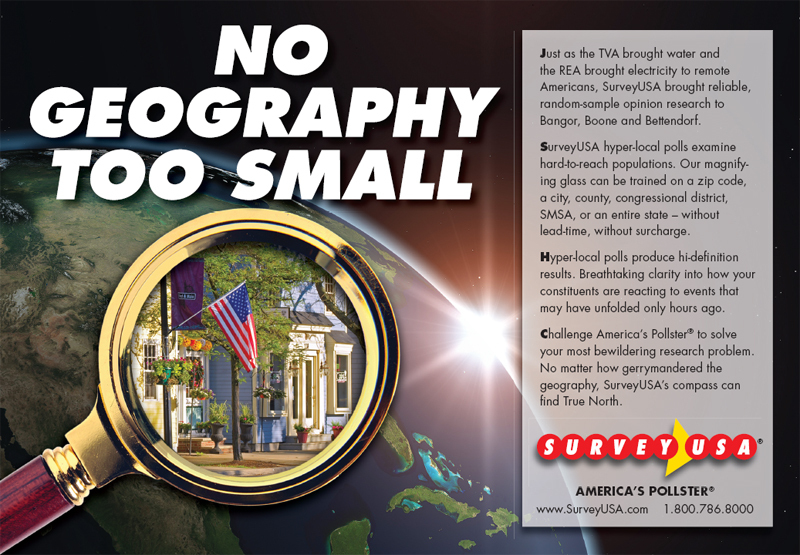 From the ground-up, SurveyUSA was built to be nimble. We were conducting iterative research in 1992 before anyone knew that was a “thing.” We perfected “agile” when the researchers who today champion the need for market research to be agile were still in grammar school. Bloated multi-national research conglomerates can pretend to be nimble and can send out press releases announcing new “Quick” product offerings. But the reality is unchanged. Corporations built to be slow are slow. 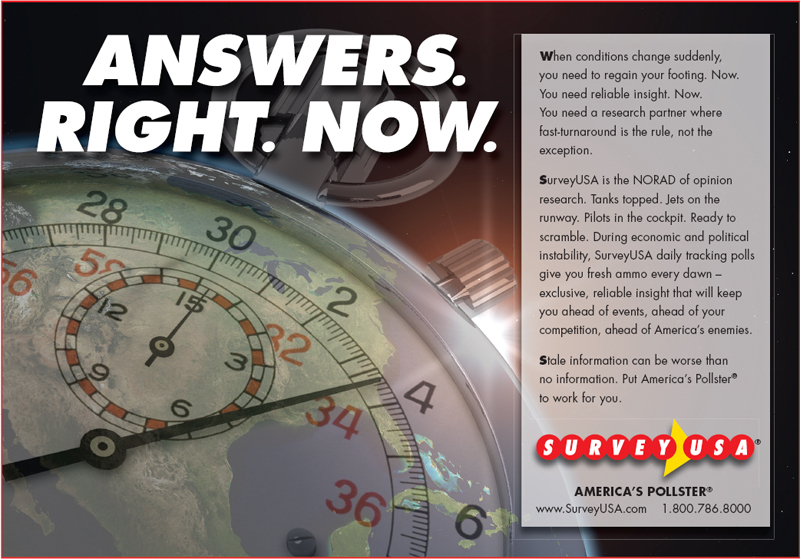 At SurveyUSA, once we have questionnaire lock, we commit to start programming your research before the sun goes down. We commit to launch your research on or before the next business day. We commit to monitor your progress as your job progresses. And we commit to complete the field period for your job on or ahead of schedule. There are trade-offs that come with “barge-in” research methodologies, where SurveyUSA can control how quickly the interviews are completed, and “in due time” methodologies which allow the respondent to participate in the survey at the time of his or her choosing. A rocket launched quickly in the wrong direction can be worse than a rocket launched a day later in the right direction. Launch is a key step in The SurveyUSA Way. We land: In gymnastics, it’s vital to stick the landing. In opinion research, that metaphoric equivalent is to present the data in a way that allows the client to effortlessly internalize the numbers and quickly internalize the insights. SurveyUSA’s proprietary SurveyDNA® back-end reporting engine, developed and perfected by SurveyUSA programmers and SurveyUSA user interface designers, is unique in the industry. No other research firm automatically and at no additional cost includes such an in-depth look at your numbers. 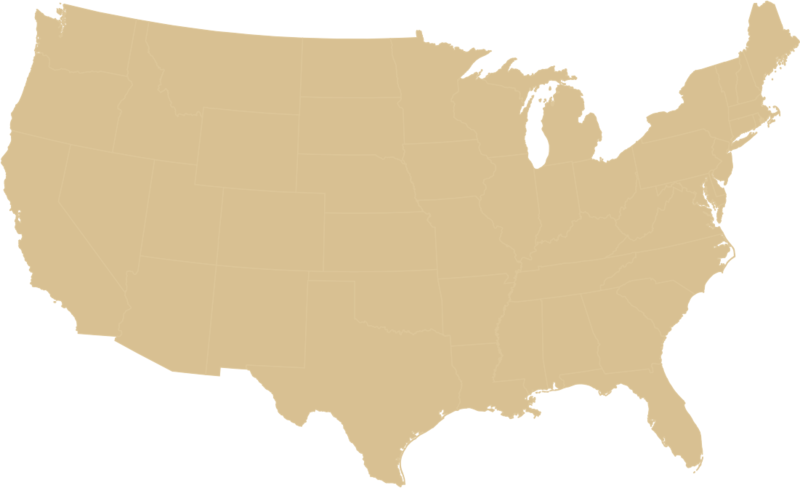 Depending on the client’s preference, SurveyUSA can deliver results to you unweighted, or weighted to U.S. Census targets. Depending on the client’s preference, SurveyUSA can deliver to you aggregated data only, or we can deliver to you individual-respondent-level data for you to import into your own database program. 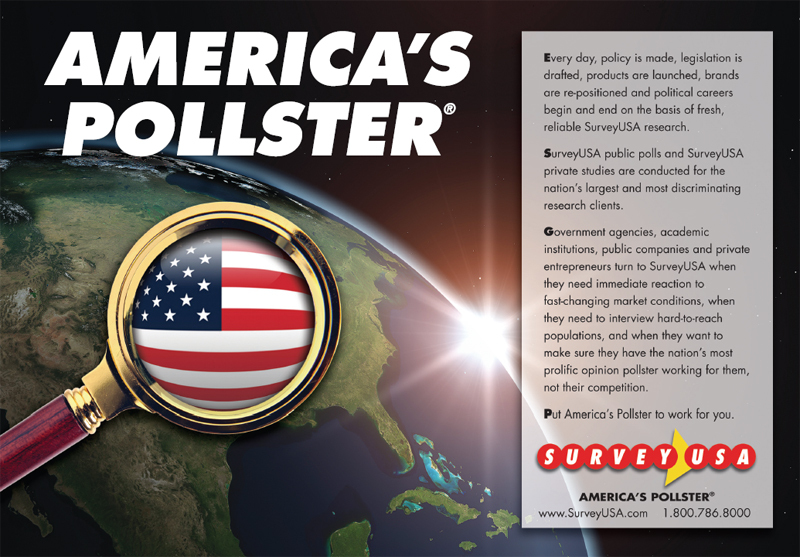 Some clients want SurveyUSA to write a top-line analysis of a study’s essential findings, which the writers who own and manage SurveyUSA are gifted at doing. Other clients prefer a more explicated walk-through of the data, with PowerPoint slides that chart and graph the key pieces of learning and separate the signal from the noise. Some clients would like the data presented to a room full of stakeholders using a screen-sharing service such as join.me or ReadyTalk. 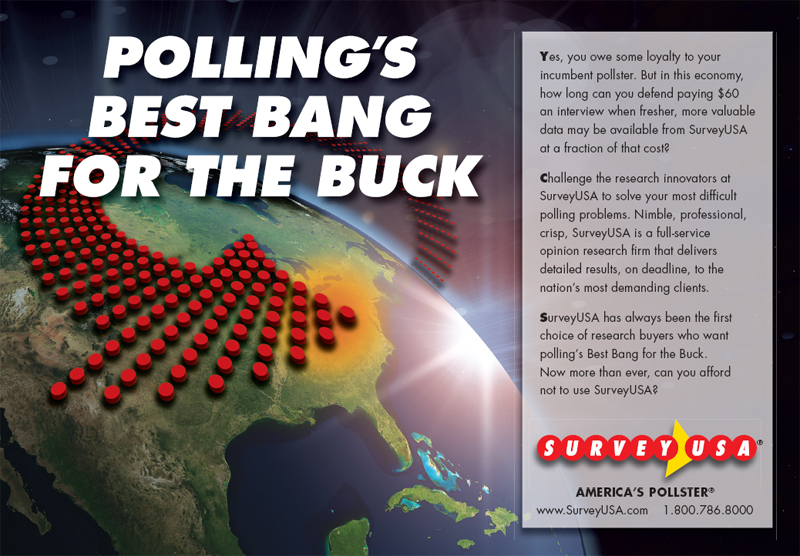 And still others want SurveyUSA to jump on an airplane and present the research findings in person. In every case, SurveyUSA has one goal: to make sure that the client has learned what it set out to learn.